Crumbly pastry that melts in the mouth, juicy berries with a hint of spice, the tang of brandy. Served hot and drizzled with cream, nothing quite says Christmas like a mince pie. 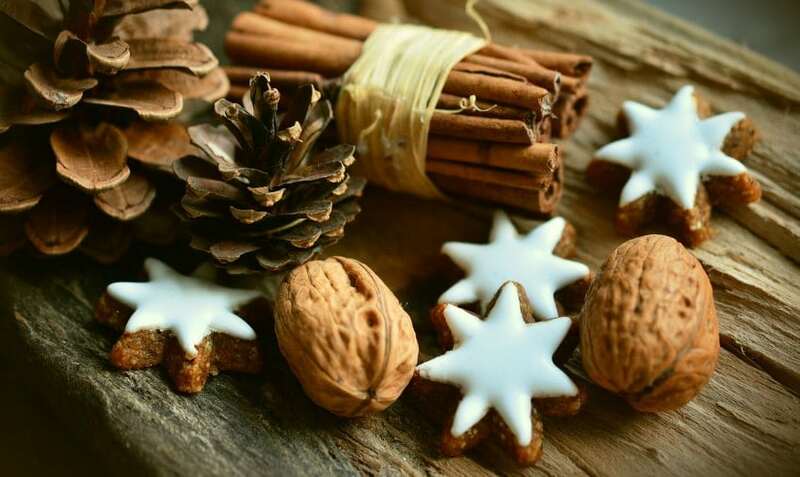 This seemingly simple festive snack is available in every supermarket, but it has a complex journey involving many people, businesses and resources. But it’s a one ingredient – palm oil – which links this humble pie to deforestation, human rights abuses and climate change. 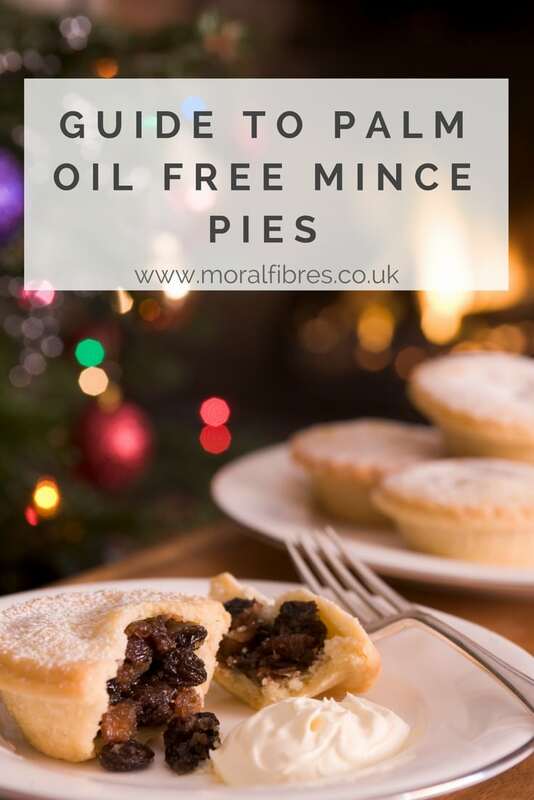 Georgina Rawes from Ethical Consumer looks into the issues behind palm oil production and shares her top five palm oil free mince pies. Palm oil is found in around half of all packaged foods and in many other household items, from cleaners to cosmetics. It is cheap, widely available and solid at room temperature, making it an appealing fat for manufacturers to use. In mince pies, palm oil is found in the vegetable suet used to make the mincemeat. It gives the juicy filling the firm and creamy texture that we all love. But, there is a bitter and unpleasant story behind this popular ingredient. Over 90% of the world’s palm oil is grown in Indonesia and Malaysia, across 16 million acres of land. As plantations grow to meet demand, they claim rainforest, razing them to gain valuable farmland. In fact, palm oil plantations are one of the leading causes of deforestation, forcing indigenous people from their homes and threatening endangered species living in these diverse ecosystems. As rainforests are cleared, carbon dioxide is released. In fact, deforestation accounts for 10% of all greenhouse gas emissions and is a major contributor to global warming. This in particularly pronounced in Indonesia, as the United Nations Environment Programme (UNEP) indicates that 98% of Indonesia’s rainforests may be gone in the next four years. As well as the clear issues involved in deforestation, palm oil production is riddled with supply chain management issues. There are an estimated 3.5 million workers employed on Indonesian and Malaysian plantations where child labour and modern-day slavery still occur. Many products now state that they contain sustainable palm oil. Whilst this seems to be a good thing, the reality is more complicated. Certification groups, such as the Roundtable on Sustainable Palm Oil (RSPO) have been criticised for not going far enough to ensure that members are acting responsibly and there are RSPO members who have been exposed as having environmental abuses and human rights issues in their palm oil supply chains. So, where products seem to contain sustainable palm oil that is not linked to deforestation, this might not actually be the case. Action groups such as Sum of Us, are campaigning for RSPO to vote to adopt a no deforestation, no peatland, no exploitation certification system. Organic and made with sunflower oil instead of palm oil, these pies come in 100% recyclable packaging and are priced at £2.50 for four. Available from Waitrose online and in store. Perfect for parties, these mini versions of a classic come in three varieties. They contain rapeseed oil and are suitable for vegetarians, and cost £16.00 for 36. Available from Marks & Spencer online and in store. These handmade mince pies are equally at home on the dinner table as they are beside a cup of tea. Beautifully finished, they are made with sunflower oil and are available through organic retailer Abel & Cole at £5.39 for a pack of six. These pies contain no additional fats in the mincemeat, only fruity fillings. They are available through ethical online retailers Real Foodspriced at £5.95 for six pies. Organic, vegan and gluten-free, these mince pies tick all the boxes. They contain no added sugar and are made with cold-pressed olive oil in place of palm oil. Available online at Artisan Bread Organicat £5.25 for a pack of six. For more information on palm oil, check out our full special report. And to learn how to avoid palm oil in your Christmas shop, see our guide to a palm oil free Christmas. 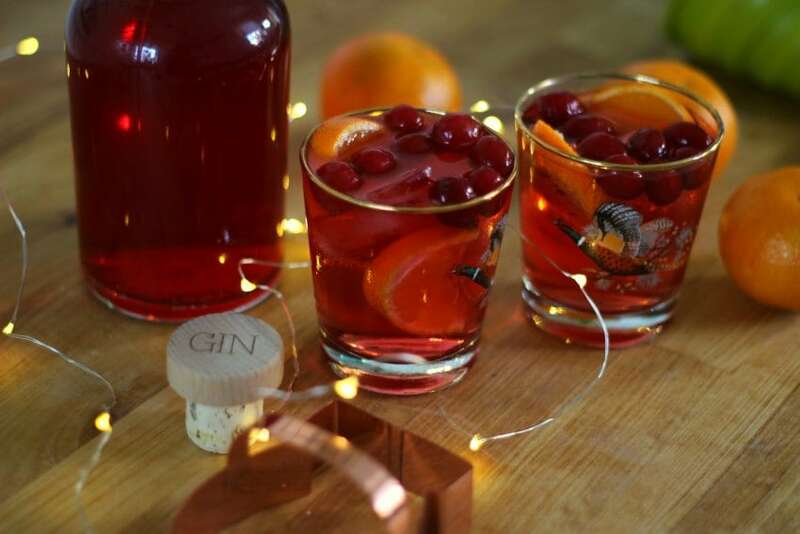 Seeing as it’s nearly Christmas, and I started the week sharing a festive dish, I thought I would continue the festive theme and share my cranberry and orange infused gin recipe. It has a fresh festive flavour without the sweetness of many drinks of the season. You can prepare this now ready for Christmas and it would make a lovely homemade gift for any gin lover. Or you could just keep it for yourself – your call! The very best bit is that the recipe has a skill level of precisely zero – if you can add some berries to some gin then you can make this recipe! Aka, my favourite kind of recipe! 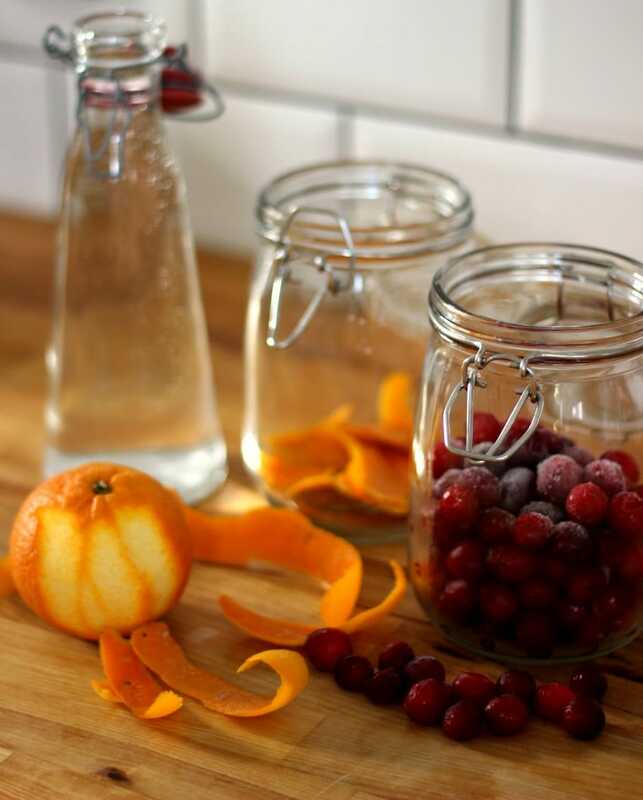 To your sterilised jar, add the fresh or frozen cranberries and the peel of the oranges. Pour over the gin, and seal the jar. Place the sealed jar in a cool dark place for at least 3 weeks, shaking every three or four days. After at least three weeks, you can strain the gin off through a muslin lined sieve into a measuring jug or bowl. Put the gin to the side for a minute, and in a separate pan add 1/4 cup sugar and 1/4 cup water. Dissolve the sugar and water over a low heat. Once dissolved, add a little bit of the sugary water at a time to the gin, tasting as you go, until you have the desired sweetness. 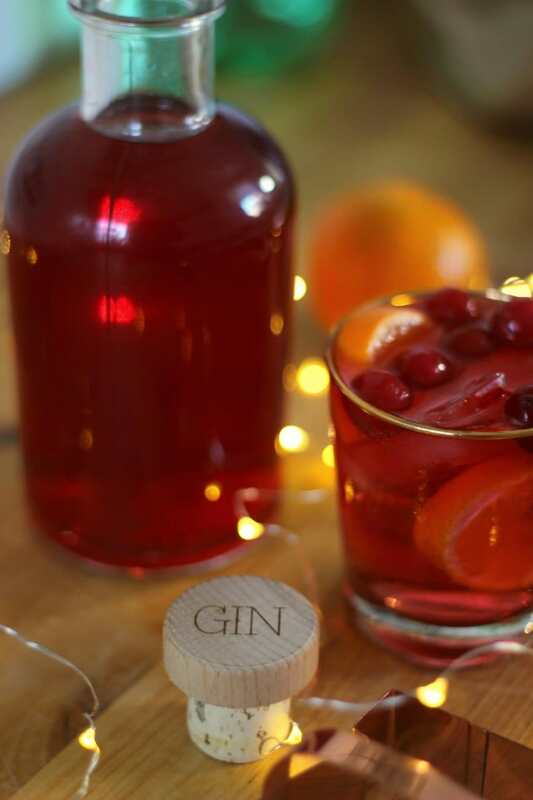 Mix well and decant into a sterilised bottle, and your cranberry and orange infused gin is ready for drinking or gifting. I decanted the finished infused gin into one of these pretty decanters that I was gifted from Clouds and Currents. The stopper can be personalised for an extra special touch. At this time of year you can easily buy fresh cranberries in many large supermarkets. If you can’t find fresh ones then frozen ones work just as well. I’ve used frozen cranberries because I picked them up really cheap in January (like 50p a big bag cheap) but even now the frozen ones are relatively inexpensive. There is no need to defrost frozen cranberries before using them and there is no difference in flavour. Gin wise, I wouldn’t buy the cheapest gin in the shop. Buy a bottle that costs £2 or £3 more (like Gordons gin for example, rather than the cheapest own brand gin), and you’ll get a better tasting gin. Don’t go crazy and buy a really expensive gin mind you: you’ll lose the lovely subtle flavours of your fancier gin. I have taken advice from Sipsmiths (as they know a thing or two about gin) and utilised their sloe gin advice – whereby they advise adding the sugar at the end of the infusion process rather than the start. They say that “contrary to popular belief, there is very little point in adding sugar at the outset. Saturating the spirit with sugar prevents it from extracting the natural fruit sugars – and other flavours – from the [fruit]“. Having made infused gins in the past where I’ve added the sugar at the same time as the fruit, I have to say I completely agree with Sipsmiths – by adding the sugar at the end also means you can control the sweetness more accurately. 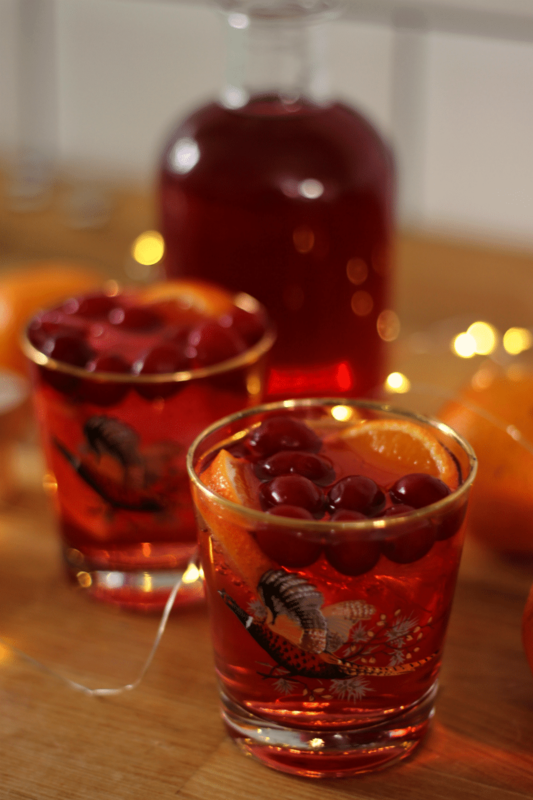 The gin will taken on a stronger cranberry and orange flavour the longer you leave the fruit in, so if you prefer a stronger flavour then leave the fruit in.